No! Raising the minimum wage will make jobs harder to get. Yes! Raising the minimum wage will make jobs easier to get. Yes, but no more than $10/hr for now. 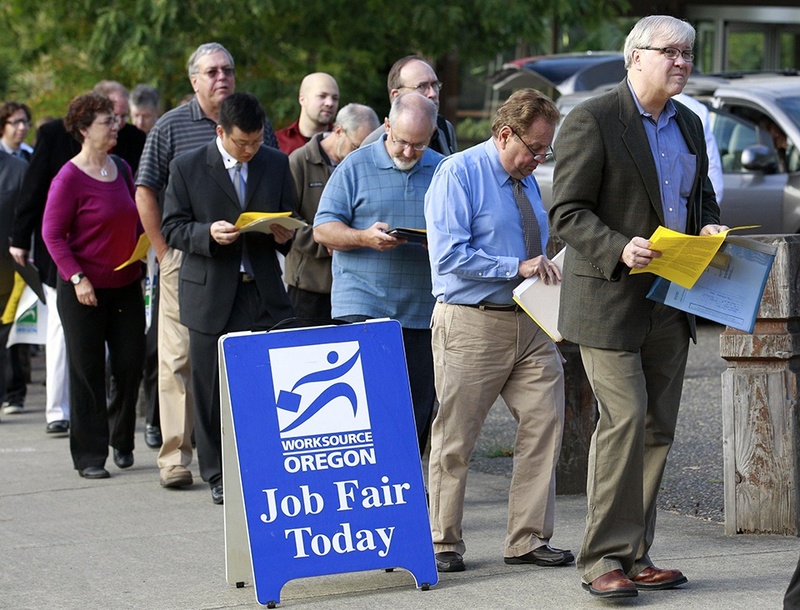 Does raising minimum wage increase unemployment? Yes, raising the minimum wage will increase unemployment rates significantly! Raising the Minimum Wage Leads to Job Loss! In 2009 Congress increased the federal minimum wage by 10.6%, and within six months 600,000 jobs disappeared. I really wanted to write an article about the pros and cons of a minimum wage increase. But unfortunately, I couldn’t come up with any valid reasons for an artificial increase in wages. It is a temporary feel-good solution with devastating economic effects. Employers will cut hours and lay off employees if minimum wages are increased. It is a fact that small business’ make up well over 50% (almost 2/3) of Employers. If a small business owner employs ten people at $8.25/hr and overnight has to pay them $15/hr, then tomorrow he will only have five employees. This is because if his most significant expense (payroll) doubles overnight, he will compensate by reducing that expense by half. It is true that the five remaining employees will have more disposable income, but the five who were terminated will now have no income and be looking for jobs in an already over-saturated job market. If you support a minimum wage increase because your hours have been cut recently, realistically, what do you expect will happen if your hourly rate goes up. Your boss will either reduce your hours even more or terminate your employment altogether. Employers who are paying more money will have higher expectations from the employee. He will now expect the new employee to be twice as productive to earn the higher pay. He will be much more particular about who he hires. He will expect the applicants to possess the skills and experience already. Raising the minimum wage increases the bar of expectation that employers have which in turn will make jobs much harder to get especially for people without any skills or experience. Now add all the newly out of work people to the job pool, and you have just created a situation where it will be almost impossible for the average person to get a job. How do you think your employer will make his decision about who gets to stay and who he terminates? You had better be one of the hardest working ones or at least be related to him. If you expect to keep that job, you had better work at least twice as hard as you did before because there will be a long unemployment line of people waiting to replace you if you don’t. The other argument from the socialists is that everyone deserves to make a living wage. Yes everyone who earns it does deserve to make a living wage, but when we first get out of school, or it is our first job, it is not intended to be a career job. Min wage jobs are designed to be stepping stone jobs that allow new employees a chance to get a job and then learn new skills and gain experience in order to get promoted or get another job that pays more. I feel comfortable knowing that if I ever lose my job and need something temporary, I can go to any McDonald’s or Walmart and get a job relatively easily to tide me over until my other job applications pan out. If you take that away from people, you will have many more people out of work. People earn their worth. I know this will sound callous, but if anyone is working a min wage job for more than six months, they had better take a good look in the mirror to figure out why. If you are still making min wage after two years of employment, you better know the reason why is YOU. There are two reasons for this. Either you cannot perform well enough to get raises or promotions due to a mental or physical disability, or you are not applying yourself enough. If you have a confirmed psychological or physical disability, then there either are, or should be government programs for you that would make up the difference between your earned income and your living necessities (living wage). If you are just not applying yourself enough or not being productive enough, then you need to motivate yourself more. There is no better motivation than a necessity. Does Raising Minimum Wage Increase Inflation? Yes, Of course raising the minimum wage will increase inflation. Labor is the biggest expense of most business’. The employees cost more money than the hamburger meat, the buns, the lettuce and tomatoes, the cheese or even the extra bacon strips you might add. So if you double the labor expense, you better believe he will double the price of the burger. Honestly, this isn’t good for the consumer or the owner. Less people will go out to eat if this happens. Artificially Increasing Wages Does Not Work! If you make twice the money you used to make but now everything costs twice as much, its like you didn’t even get a raise at all. This is why artificially inflating your salary will not work. The right solution is to build up the economy. It’s the law of supply and demand. When there are more jobs, there will be more demand for jobs and less people in the unemployment line. This will force employers to pay more money. Only this time they will be able to afford to since they will also be making more money. Of course you can’t just wave a magic wand and artificially make the economy better either. It has to naturally grow. That means doing things that are conducive to a good economy. It also means NOT doing things that are counter-productive to a thriving economy… Like artificially raising the minimum wage. I hesitated to bring up this point but it does play a role. United States Currency used to be backed by gold. Do you see where it says “redeemable in gold on demand” on that $100 bill? The federal reserve used to keep a tiny amount of gold for every bill that was in currency. In this case, it would be $100 worth of gold. However much that would have been at the time. Somewhere between 1928 and 1933, the government stopped allowing people to redeem currency notes for actual gold. Supposedly, they still kept the gold. 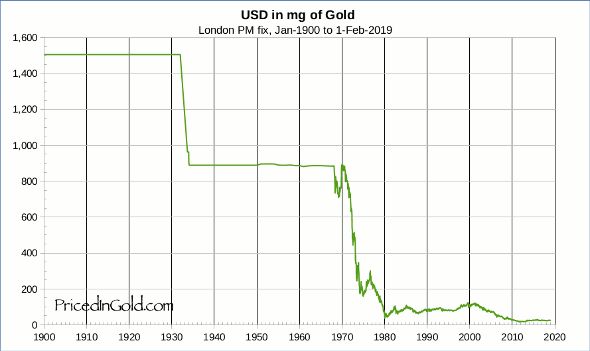 However, in or around 1971, they admitted to not holding the gold anymore. Now, I’m going to take a guess at some numbers. I’m not a financial historian so these numbers won’t be exact but they should be good enough for our conversation. If you are a genius and you know the actual figures, please leave a comment below and I will update the post. I’m guessing if you had a dollar from back in the early 1900’s, it would be worth about $66 today. It may be worth considerably more to a collector if it is in good condition, but I’m just trying to demonstrate what our currency should be worth if we had kept our gold standard. Unfortunately, United states currency is worth much less than the actual face value. If you think things are expensive nowadays, they really aren’t. Our dollar is just worth less than it should. Forget about what a dollar should be worth if we still used the gold standard. It should at least be worth one dollar, right? Of course it should but it doesn’t because we have printed so much money. We have diluted the value of our US currency. If you have one million dollars and you print one million more. You physically have notes that say two million dollars, but the value is still only one million dollars. I calculate the current value of the US dollar to be around $0.47 cents. This is why gasoline costs so much. It’s only worth about $1.25 a gallon but you end up paying around $2.50 per gallon. If the value of the US dollar was stronger, it would be like making more money without ever having to artificially raise the cost of everything by increasing wages. Does Raising the Minimum Wage Help The Poor? The Socialists claim that raising the minimum wage will get people off welfare, food stamps and public aid. This is also false. Even if it did help with all those issues, it would still be offset by all the damage I already covered above. Raising the minimum wage will not help the poor. Did you know that only 1/3rd of the people who make min wage are living below the poverty level? That is because 60% of the truly poor are out of work altogether and 2/3 of the people who make min wage are teens and new-comers to the job market who still live at home and are not necessarily poor. That means a large portion of the targeted benefactors will not be affected at all by raising the min wage except that it will be harder for them to find a job when they do start looking. Democratic Socialists love to say “we are not targeting small business’, we are going after big corporations.” The starting Walmart minimum wage is $1.50 over minimum wage. The average hourly rate at Walmart is $12.91, and that does not include upper management like the socialist party would have you believe. Like any job, the employee should have their sights on promotions. A department manager makes $20/hr, and there are several jobs in between. An assistant store manager makes $72,000/yr. The pharmacy tech makes $121,000/yr, and they do not disclose what the actual store manager makes but it’s obviously more than the pharmacy tech. My point is that if you force them to pay two dollars more than the average rate they pay now, you are not hurting big corporations at all. In fact, you are helping them by eliminating the competition. That is a winning situation for Walmart but not for the rest of us. If the left is so against BIG Business, why would they want to do something that would help big business so much? Currently Mcdonalds minimum wage is starting out employees at about one dollar over minimum wage. So this will differ depending on your state or area. In Illinois the McDonald’s minimum wage 2019 is approximately $9.25. If you are in downtown Chicago you could start our at around $11/hr. It’s hard to calculate an exact hourly starting minimum wage at Mcdonald’s because about 90% of the restaurants are not corporately owned. McDonald’s is currently testing a new smartphone app that will allow people to place there order with the app and even pay for it through the app. All the customer has to do is pick up the order from an automated drive-through window. They are not the only company looking into this technology, so is Panera Bread, Dunkin Donuts and many other franchises and big chains. 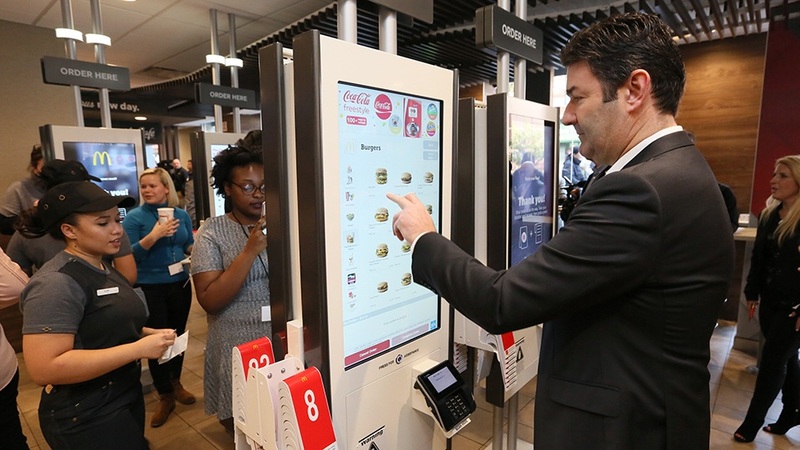 Many companies are already using self-service kiosks to take your order. What is the Federal Minimum Wage 2019? What is the Federal minimum wage 2019? The current federal minimum wage in 2019 is $7.25 per hour. This is equal to $290 a week for a 40 hour work week. It is a yearly wage of $15,080. The minimum wage rate is designed to go up commensurate with inflation. The last update was in 2009. As you can see, the inflation rate has gone down 40% since 2009. 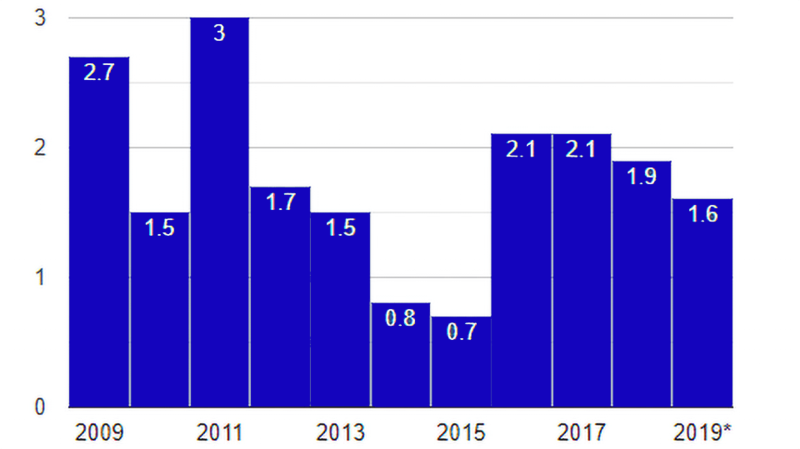 The government is waiting until the inflation rate goes up to increase the minimum wage but if they where adjusting it accordingly every year, it would be approximately $8.57 right now. I would support a raise to $8.57/hr. That is far short of the outrageous made up number the left is seeking. If you are wondering why prices of items have increased when inflation has actually decreased, see the paragraph about the value of the dollar above. What is the Illinois Minimum Wage 2019? What is the Illinois Minimum Wage 2019? The Illinois minimum wage is currently $8.25 per hour in 2019. That is one dollar an hour more than the federal minimum wage. If it was adjusted for inflation it would be $4.95/hour. What is the Chicago Minimum Wage 2019? What is the Chicago Minimum Wage 2019? The Chicago minimum wage is currently $12 per hour in 2019 and is scheduled to go up to $13/hour on 07-01-2019. Minimum wage in Chicago is 65% higher than the federal minimum wage. Even If it that rate was adjusted for inflation it would be $7.20/hour. That is a whopping 175% higher than the inflation adjusted federal amount. Chicago Employees get paid $3.75 per hour more than the rest of Illinois. Let’s say you own two hamburger stands. One is in Chicago and one is in the suburbs. You charge $5 for the same chicken breast sandwich at each location because that is what people would expect. But you pay 50% more for rent in the Chicago location and your labor costs you 45% more. Can you guess which location may have to close down soon? The real effect of raising the minimum wage won’t be to reinforce the middle class as the democrats hope. It will make an even more significant gap between the upper middle class and the desperately poor. The fact is that raising the min wage is a ruse created by politicians who have no understanding of business practices and promise higher salaries to poor constituents who don’t understand the real economic impact in order to gain votes. Aren’t you sick of being lied to by your “community leaders”? I hate to be the one to say this, but it’s the very democratic politicians who you embrace to pull you up who are keeping you down. Statistically, many people who go from rags to riches by actually earning it rather than winning or inheriting it, switch from democrat to republican. Why would any democrat politician want to lose his main voter base by helping them accomplish this? Think about it. Well if you have taken the time to read all of this, I thank you. Please join the debate in the comments section below and don’t forget to Vote in the Poll above. Please feel free to leave your comments below. You can share Your feelings or engage in the minimum wage debate.